The [email protected] is not much a ‘gallery’ in the traditional sense as it is a showcase of installation art along one of Singapore’s busiest pedestrian tunnels. The Tunnel that connects the Esplanade, Singapore’s premier arts theatre, to the malls in the City Hall area has been made available for local artists to showcase their work for passers-by to enjoy. 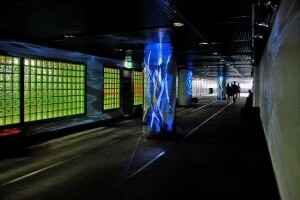 Most of the exhibits have showcased visual art in the form of wall mural, paintings and sculptures, but they have occasionally engaged with multimedia art forms that engage an elaborate use of sound and moving images to transform the Tunnel into a world quite apart from the bustle of the city outside. If the aim of an art gallery is to make the fine arts accessible, then the Tunnel has met with tremendous success in bringing a visual feast to the masses. The [email protected] is located between CItyLink Mall and The Esplanade. To get there, take the MRT to City Hall station and follow signs towards the Esplanade through CityLink Mall. Admission to the Tunnel is, of course, free of charge. More information on the [email protected] can be found here:http://www.esplanade.com/about_the_centre/venues/tunnel/index.jsp.